Editor's Note: The following is the full transcript of the interview between CNN's Zain Verjee and former First Lady Laura Bush. PARIS, France (CNN) -- Zain Verjee: Bonjour! 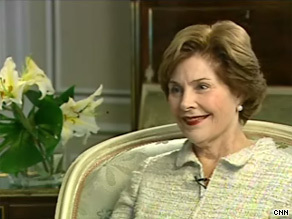 Former First Lady Laura Bush defended U.S. President Barack Obama's decision to address American schoolchildren. Zain: You're here in Paris, for an important event, you're going to be talking about literacy worldwide. What is your one key message? Laura: Well, the one key message is how important it is to read and how governments really need to focus their priorities on making sure everybody in their countries can read and that's what UNESCO does. UNESCO is the big U.N. agency that has education as part of its charge and this is the decade of literacy and the decade will be over in 2012 so we've got a lot of work to do to make sure people learn to read between now and then. Zain: How do you make governments have literacy a priority? Because if you look at Africa, you look at Asia and so many other places around the world, governments have to struggle with so many other things there's corruptions and there's.... how do you do it? Zain: So it's really a way to put pressure on governments? Laura: That's right and to help them in whatever way they can, because you're right, the countries with the highest illiteracy are also the poorest, they are the countries with the least capacity to be able to build education systems. Zain: Let's talk about Afghanistan, something that for many years that you've really cared about and you've personally talked about women in Afghanistan in particular. But right now Afghanistan is facing allegations of its election being marred, there are more civilian deaths and the Taliban seem to be getting stronger -- none of which is good for women especially. What's your reaction to the state now? Laura: Well, I'm very concerned of course and I think that everybody who has invested anything in the lives of the people of Afghanistan are concerned. We are concerned for our own troops that are there and their safety and of course I'm concerned for the women that are there who are trying to really make a life, the ones who are in school. I've just met with a group of women who were in Dallas, who were in the United States on a program where they were matched with an American business woman mentor. These are women who are making a life for themselves and are living for themselves in Afghanistan by working, all of us are concerned and everybody as they look at Afghanistan from around the world really hope and want to whatever they can to help the government stabilize, to see that the elections were fair and to find out what the results of those elections are. Zain: Do you think it could fall apart? Is it on the brink? Laura: I don't know if I would say that, but I think it's worrisome and I want people, I hope that people, will redouble their efforts, both within Afghanistan and all the people that help from outside of the country. Zain: You've been very outspoken too about Burma and the plight of Aung San Su Kyi the pro democracy leader. Do you think the military junta is just scared of her and don't her want to contest the election? Laura: Sure, absolutely, that's the reason I think she's always been held under house arrest. They're afraid of her popularity, they think that undermines their regime. Her party the National League for Democracy was elected overwhelmingly and the results of that election were disregarded by the military regime and she was put under house arrest for most of the years since then and yes I think that's what they are. But I hope that they'll see what she really wants, she wants a dialogue, she wants a way for the ethnic groups and the National League for Democracy people and the regime to come together, she wants it to be a peaceful transition to a democracy and to have the chance for Burma to really build itself as what it used to be and that is a very wealthy and educated nation. Zain: What's your message for her? Laura: Well I just admire her so much, I mean my message to her is how much I admire her courage and watch from afar and I hope someday I'll have the chance to meet her. Zain: What's it like for you being a private citizen? Laura: ....getting some furniture, we've had a lot of fun working on that, we're both working on our memoirs, writing our memoirs and then we're also building the Presidential Library at SMU with the institute which will be a part of it and I've been a chairmen of the design committee and that's been a lot of fun to work with Bob Stern, our architect, and Michael Valkenburgh, our landscape architect. We just had our last design meeting so now we'll go to the construction plans and get ready and I hope to break ground in sometime in a little over a year. Zain: Give us a taste of your memoirs, give us a tease. Zain: What would surprise readers for example? Laura: Well I think maybe parts of my background would surprise readers, I'm talking about growing up in west Texas and what that was like and I think there's maybe a stereotypical view about what that would be but I think people would be interested to hear what it was really like. Laura: Exactly, so all of that will be part of it, and it's been fun and interesting to work on because you know I think there's something sort of psychological I think about writing your memoirs. And as you go through it you see a lot of sides of every part of it that happened to you. Zain: How's President Bush, doing is he glad to be out of the spotlight? Laura: Yes a lot better than me, he's always been a lot more disciplined than I am... so he's working on those, I keep telling him that I've got to the second grade in my memoirs. Zain: How do you think the world will remember him? Laura: Well I think the world will remember him really for what he is and that's what they will get to see both from his memoirs and from mine and that is somebody who stood for freedom and who stood for the security of our country and I think people know that and I think the people that really know him, know what he's like and they see what he stood for and that's the freedom of 50 million people in Afghanistan and Iraq. Zain: Many around the world would say that he stood for divisiveness and destructiveness? Laura: Well, I would say that that's absolutely not right and I don't think they have either the right view of him or what his responsibilities are and were as President of the United States. Zain: How do you think Michelle Obama is doing? Laura: I think she's doing great I think she's doing very well. Laura: Well I saw her, I saw her at the funeral, Teddy Kennedy's funeral last week and asked her about the girls and how they're doing and I know what she's doing, you know, it's what every woman who moves there does and that's to try to make it a home. Both for her husband, who's the President and for her children. Zain: President Obama is giving a back-to-school speech and there's so much controversy over that, do you think it's a good idea? Laura: I think there is a place for the President of the United States to talk to schoolchildren and encourage schoolchildren and I think there are a lot of people that should do the same and that is encourage their own children to stay in school and to study hard and to try to achieve the dream that they have. I also am happy that it seems that the Obama administration has not backed off the accountability part of the No Child Left Behind Act that President Bush worked with Ted Kennedy on to pass and I think that's really important. We want every American child to have the very best education possible and I think that's what that legislation really demands. Zain: The, er, the issue that's been raised, by many conservatives that are critical of this, is that they say that, this is a dangerous socialist plot, it's indoctrinating school children, some parents say no, our kids are staying home and not going to listen to the President talk about education and schools. Laura: Well that's their right, you know that certainly is the right of parents to choose what they want their children to hear in school, but I think really what people were unhappy about were the guidelines that went out with the... before the.. speech went out with the, um, and I think those have been changed and I think it is also really important for everyone to respect the President of the United States. Zain: Do you think that it is fair that Obama is criticized as a socialist? Laura: I'd have no idea whether it is fair, do you think I thought it was fair when President Bush was criticized? Not really. So I guess not. Zain: President Bush was criticized, he was called by many in the left as a fascist- what kind of advice would you give President Obama in how to handle a situation like that? Laura: Well I wouldn't give him, you know, any advice. I don't think I need to give him any advice but I think it is just what happens and people know it and our country is, because of our very really safe congressional districts everywhere in our country, we're polarized in the sense that a lot of people are on the right, a lot of people are on the left and we've seen that for the last eight years certainly and we're still seeing it and that's just a fact and I think it is important for everybody who is elected, Republicans and Democrats and independents, to do what they can to really be bipartisan, to come together and its difficult. I know that was one of the real disappointments for my husband when he moved to Washington because in Texas when he had worked with the Democrat Speaker of the House and the Democrat Lieutenant Governor and they had been able to come together for what was best for our state and he was disappointed that that was not the way it worked out in Washington and we're just still seeing that I think. That's just a fact of life in American politics and I think people... I'm sure President Obama didn't expect it to be that way but you know, it is that way and I think all of us need to do what we can to come together on issues. Zain: Do you think he is doing a good job -- President Obama? Laura: I think he is, I think he has got a lot on his plate and he has tackled a lot to start with and that has probably made it more difficult. Laura: I think that Vice President Cheney has every right to speak out and I appreciate that he is defending the Bush Administration and his administration. think that is important, I think there is a place for that. Laura: No not at all. Zain: And is he still in contact with Vice-President Cheney? Laura: Sure, they talk occasionally. Zain: One thing that you have been doing that you care tremendously about is healthcare. Tell us a little bit about the institute that you've set up and the breast cancer awareness work that you have done. Zain: What was that like? Zain: What did they tell you that you were struck by? Laura: Well I was struck by...I mean well obviously when people get sick, humans are all alike, we fear, especially women fear breast cancer and I think it really gave me a chance to talk in a much more personal way with Saudi women than I would have if I had another topic that I was talking about but also I'm proud that cancer detection centers went up in Saudi Arabia and that many, many Saudi women are taking the opportunity now, women in the Middle East for some reason that we don't know are presented earlier with breast cancer so once it is diagnosed they are a lot of times in too late of a stage of cancer to be treated successfully so it is important to get that word out and then the other two women's health centers that I work with I worked with, the Heart Truth, letting American women know that heart disease is the leading cause of death among American women because many women think that heart disease is a man's disease and they don't get to the hospital fast enough if they start having symptoms of a heart attack and then the third is the Laura Bush Institute for Women's Health that's at Texas Tech University, which was my father's university and they have clinics, their medical school, all over west Texas which is where I'm from so that has been fun to partner with them. Zain: So you've been very busy, what about your daughter Jenna, she's going to be a correspondent and contributing to the Today Show. What do you think of that? Laura: I'm proud of her for that, I think she'll have a lot of fun with that. She wants to bring stories about education, because she's a teacher and she's continuing to teach as well, to the attention of the American people. Zain: Maybe she'll get to interview you and be in my spot at some point? Laura: Yeah that'll be fun. Zain: Just a couple of quick things- what are you reading right now? We always like to know what's Laura Bush reading. Laura: I've just read two memoirs by Nuala O'Faolain, who is an Irish writer, she is no longer living. I've been reading a lot of memoirs since I've been writing a memoir it's sort of a genre that I didn't read that much before. I like to read literature but those have been very interesting and they are very interesting especially for me and for women my age because she wrote them when she was my age and just like I'm writing a memoir now it's a time in life when, for me especially now that I am retired, to look back and look forward to those years that come next, so I love both of her memoirs. I just read "Are You Somebody?" and then the newest one. Zain: Merci beaucoup chère madame. Laura: Thank you very much. Merci beaucoup.